"Tonight" is a single from Tina Turner's album "Tina Live In Europe". This song was written by Iggy Pop and Tina’s long time friend David Bowie. Iggy Pop released it first in 1977 on his 2nd solo album “Lust For Life". The original song was about a lover who died from an overdose of heroin. David changed the song into a beautiful love song, influenced with Reggae. The song now was about a couple coming together for a beautiful night of romance without any disturbances. David didn’t want Tina to sing about a drug victim. Then David recorded the song for his “Tonight" album. He invited Tina to record the song with him. David Bowie was no stranger to Tina. David followed Tina over the years and always said that she was his favourite artist. However for this particular recording, David sure was very nervous to welcome Tina. Everything had to be perfect for her. 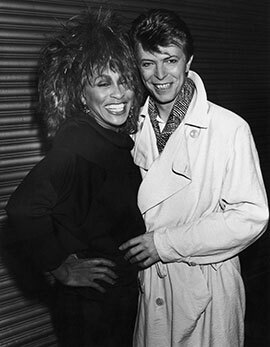 After a day in the studio, Tina, David and a few others went out for dinner that night and Tina and David learned a lot from each other’s personal lifes. They found out that they both were practising Buddhism and it became a great meeting. David wasn’t so nervous anymore and after a few drinks, it became a fun evening with much laughter. The original recorded version was released in 1984 but wasn’t a huge success. It was released as a 7" single and 12" single and has some mixes as well. These are some of the Remixes. "Tonight" 7" Single Edit – 3.43 min. "Tonight (Vocal Dance Mix)" – 4.29 min. "Tonight (Dub Mix)" – 4.18 min. Tina invited David during the Private Dancer Tour in Birmingham, to sing their song together. 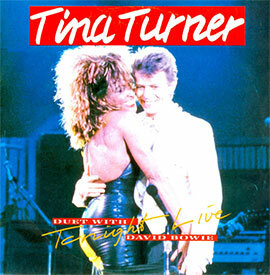 This concert was taped on VHS and is known as “Tina Live The Private Dancer Tour" 1985. Tina came out in a beautiful dramatic dress which was made by Azzedine Alaia. Tina introduced the song to the audience and as a so called surprise David Bowie came out of the blue, as a white prince charming to sing with Tina. The audience became completely crazy, when the both were singing and dancing romantic together. Timmy Capello, Tina’s saxophonist, plays a dramatic saxophone solo during their dance and the song was complete. It wasn’t the only song they performed together. They’ve also performed "Let’s Dance". 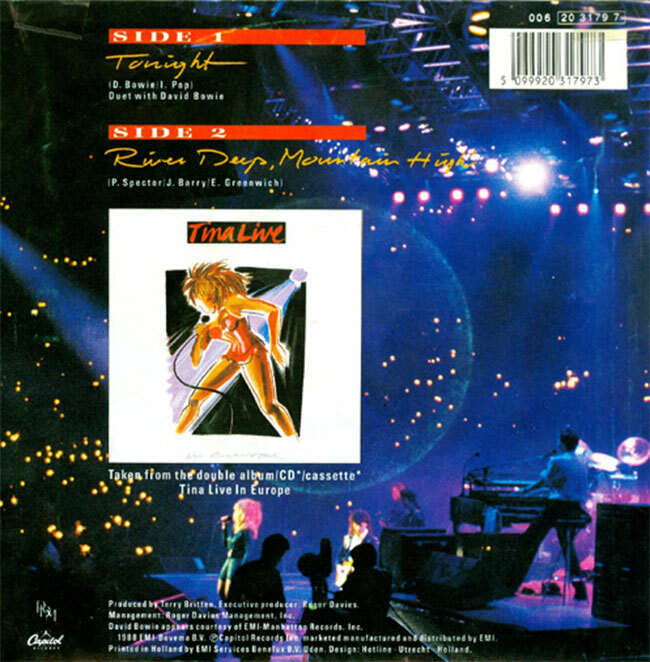 Tina already enclosed the original song in her setlist, but David released his hit song which was also called “Let’s Dance". They’ve sang both versions in a medley together and the magic of this dream couple was like fireworks on the 4th of July. Even personally between David and Tina has been some fireworks. David told the world in his autobiographical book that he and Tina have had a night of good loving before they performed together. 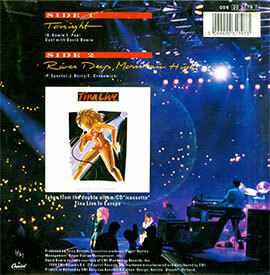 Tina released the live version of "Tonight" in 1988 as a single for her album "Tina Live In Europe". The single was a massive hit in Belgium and even topped the charts in Poland and The Netherlands. It was Tina’s first and only number 1 hit in The Netherlands. "Tonight" was recorded live in 1985 and of course they’ve used the magic live video of Tina and David together in Birmingham. The single was released as a 7" single, 12" singe and cd single. The B-side was a live recording of "River Deep Mountain High" which was also included on the “Tina Live In Europe" album. David passed away at the age of 69 last January (2016). Unfortunately he was diagnosed with cancer and suffered from it. Tina was heartbroken. She reacted “A piece of my heart has broken. Not only was David a passionate supporter of my career but more importantly a very special person in my life. An icon. Irreplaceable loving friend. I am missing him greatly". David and Tina were friends until the end and David even attended her wedding with Erwin. 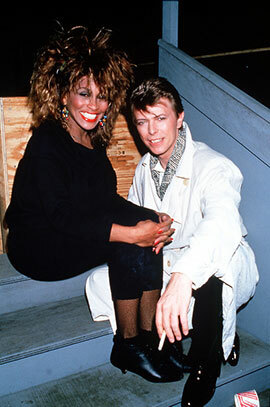 We Tina Fans will never forget the contribution of David Bowie to Tina’s career and the Icon he was. We all will see you in heaven David. When I was a little girl, I had a rag doll? The only doll I ever owned? And do I love you? When you were a young boy, did you have a puppy? That always followed you around? Oh and I love you baby! Ooh, do I love you?